On September 10, 2004, I left San Francisco, California, bound for Lima, Peru. I had a lot of fears, dreams, and ideas when I got on that plane, but I never could have predicted where I’d end up! Now, almost eight and a half years later, I’m writing this from my apartment in Buenos Aires, Argentina, which my husband, Roberto, and I keep as a home base. Over the years, I’ve been called a traveler, a nomad, a gringa, an expat, a backpacker, a digital nomad, a location-independent professional, and who knows what else. Along the way, I’ve learned a lot about myself, life, work, and this nomadic lifestyle—what I’ve come to call Nomadtopia. Here are just a few of the things I’ve learned. 1. The best way to get clarity is to take action. My round-the-world trip in 2004 was amazing, but I was on the move almost constantly, trying to squeeze in as many destinations and experiences as possible. After my trip, I decided I wanted to go and spend more time in one place, getting to know the culture on a deeper level, so I moved to Argentina. I wouldn’t have known I wanted that experience if I hadn’t started traveling. You can wonder for years what it would be like to travel long-term, or to live in another country, or to backpack across Europe, but you won’t really know what it’s like—and if it’s what you really want—until you’re doing it. When you take action, you have immediate feedback on what works and what doesn’t, what you like and what you hate. And even better, none of it’s permanent. If you don’t like where you are or what you’re doing, you can change it. 2. I’m much more likely to regret the things I haven’t done than those I have done. This ties in nicely with the previous lesson. I’ve certainly done some things over the years that didn’t pan out: moved to Los Angeles for a relationship that ended a few months later, moved to a smaller town in Argentina only to realize I’d rather be in a big city, started businesses and projects that didn’t turn out the way I’d hoped. But I don’t regret any of it, because I learned from each one, and instead of wondering “what if?,” I can now easily move on to something else. Whatever you’re thinking about doing, go for it! 3. Lower fixed costs = greater flexibility. Having low fixed costs has made my Nomadtopia much less stressful over the years. When I know I don’t need to worry about how I’m going to pay the bills, I can be more flexible in deciding how much work to take on, and it buys me time to build my business. Keeping expenses low also frees up money for more travel and other cool experiences. When you live a more nomadic life, it’s pretty easy to keep costs down because you often won’t have those typical expenses like a mortgage, car payments, cable, commute, and more. Lower fixed costs doesn’t mean living like a miser; it means spending money in a way that reflects what’s really important to you. 4. The less stuff, the better. The times I find myself the most frustrated, fed up, and overwhelmed are often the times I’m feeling most bogged down by stuff. Mostly I’m talking about physical stuff: I get pissed off when I have to carry tons of crap around, or when I am surrounded by boxes full of things I’m not sure why I’m saving. Sometimes it’s about other “stuff,” though. Expectations, obligations, fears, and worries can be just as much of a burden as an overpacked suitcase. Getting rid of your stuff—both physical and emotional—lightens the load and makes traveling easier and more carefree. Start now to declutter both your home and your mind, so you won’t have to carry all that crap with you wherever you go. 5. Don’t listen to the people who say it can’t be done. I’ve been told it isn’t possible to do what I want to do, or that it will be a big mistake. I’ve been questioned on whether my decisions are good for my job security and my relationship prospects. When these comments surface, I’m prepared for them. I know how to respond, and I know I don’t need to listen to them, because I have plenty of role models who prove it can be done. There will always be people who will challenge your choice of lifestyle, no matter what you do. The more confident you are in your choices, the less threatening the dissenting opinions will be. Get clear on what matters to you and why you live the life you do. Find other people living differently; their example will help combat the negative voices. 6. A community of supportive, like-minded people will keep you on track. 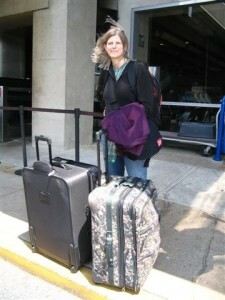 When I was planning my round-the-world trip, I participated in several online forums so I could connect with others who were doing the same thing. Knowing that I wasn’t the only one following through on a crazy idea made it all feel possible. In recent years, connecting with other online entrepreneurs has been a source of invaluable support as I’ve built my businesses. I felt most alone when I was living in Philadelphia before moving to Argentina. No one I met there seemed to understand why in the world I would want to move to another country (and many of them didn’t even know where Argentina was, what language its people speak, and that Chávez wasn’t the president!). Especially when you start to get cold feet, or feel stressed or overwhelmed, being able to turn to others going through the same thing will help you stay on track and remind you why you’re doing what you’re doing. 7. Staying in one place is easier than moving around. In the summer of 2012, Roberto and I spent nearly six months traveling around the United States. It was a great trip, but it was definitely stressful at times. Especially during our West Coast road trip, we had to constantly research where to go, how to get there, and where to stay. We sometimes didn’t know where we were sleeping the next night, and I wondered if we’d end up sleeping in the car! Working at the same time made it even more challenging, between finding stable Internet and a quiet place for phone calls, and making time to get work done. Being on the move means having to make constant travel plans. It means spending more money to get from place to place. It means having to constantly get acquainted with a new location, and having to search once again for an ATM, Wi-Fi, and a supermarket. If you’re working, it means sorting out a stable Internet connection and a place to work, again. It can be absolutely worth it to travel this way, but it’s good to know about the challenges going in. If you’re on a budget, or you’re in the middle of a big project, definitely consider staying in one place for at least a week, if not much longer. Staying in one place can also be fun because you’ll become a regular at the market or your favorite café, allowing you to connect more easily with the locals! 8. Things often turn out even better than expected. Roberto and I had a rough idea of where we wanted to go on our West Coast road trip, but found ourselves without concrete plans at some points. It was Roberto’s first time on the West Coast, and I knew I wanted to show him many of my favorite places in California, but we couldn’t figure out the best (and most affordable) way to pull it off. A couple of conversations with friends later, we found ourselves with a great little car we could use, free of charge, for several months. We definitely couldn’t have predicted that, and it made our trip better than we ever expected. 9. I can handle anything that comes my way. No matter what challenges I’ve come up against over the years, I’ve always found a way to deal with them. Sometimes things are stressful, complicated, or downright awful, but eventually, I find a way to pick myself up and move on. Each experience makes you stronger, more knowledgeable, and more capable, giving you more confidence for the next situation. If you know you can handle anything that might happen, there’s no reason not to go for it. What are you waiting for? I hope my experience and lessons learned give you inspiration and confidence to move forward in creating your own Nomadtopia or doing whatever you dream of doing in life! Which lesson resonates most with you? Let me know in the comments. Awesome post, Amy! I just kept reading until the end, totally engrossed in your story. As for which lesson resonates the most, I’m going to say all of them? I’m just starting to plan my Nomadtopia, so the one that jumped out first was the decluttering thing. But really, having other people support you is super essential, cause none of my friends really get it either (though they’re all happy to come visit me). If I *had* to pick one lesson, though, it’s the doing part. I think I want to move to Wales, but I’ve never been there. My reward for putting a lot of work into my business this year is going to be a trip there in September or October. It’s exciting, but scary, to think about taking the dream out for a test drive! A test drive is a fabulous idea; so exciting! You’re on your way. I absolutely *love* all of it. Thank you! It may be off-topic but I had a realisation concerning social media. I’ve always shied away from conversation in groups, preferring one-to-one contact. I’ve never been one for smalltalk. But now I realise I can talk to many people on social media, I can talk to the world. I wonder if anybody is listening. This is an inspiring post, Amy. I didn’t travel much when I was younger and didn’t really want to. Now I have kids to think about. But I’ve got ideas in my head that maybe, one day, I’m going places. That’s a good point; social media is a great way to talk to people, and often in a much deeper way, more quickly and easily, than you can in person (I’m not big on small talk either! ).